Thank you to the various shops for the complimentary items. As always all thoughts and opinions are 100% my own. Fall, Autumn, Harvest—no matter how you say it, this time of the year is sincerely scrumptious. The rich hues of reds, oranges, browns, and golds and the savory scents of pumpkin spice and apple cinnamon make my heart go pitter patter. Fall is my happy place, and I am 100% positive I am not alone in these fond feelings. Are you a fall junkie? If so, then surely you already know all too well the 10 reasons why fall is positively the best (dare I say the most wonderful) time of the year. Football and friends. Maybe I should clarify that I lean toward friends in this duo. What I love about football season are the get-togethers and “man” food. Bring on the fabulous friends and pigs-in-a-blanket. Please and thank you! Speaking of pigs-in-a-blanket… the food (and drinks). Pumpkin pie, apple pie (PIE, in general), pumpkin spice lattes and apple cinnamon EVERYTHING, green bean casserole (am I the only one excited about this? ), apple crisp and tarts, hot soups and stews… the list is endless. Fall food is divine. All of the cozy dresses, tunics, and leggings. This season is all about comfort. Warm and cozy describes nearly every detail, including the outfits. I’ll take any excuse to live in leggings! 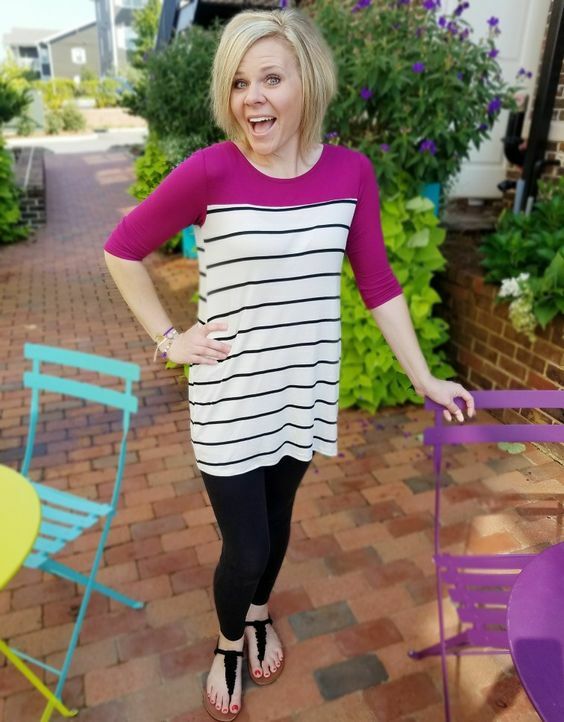 This adorable top that I paired with my simple black leggings can be found at my favorite online boutique, PinkBlush. 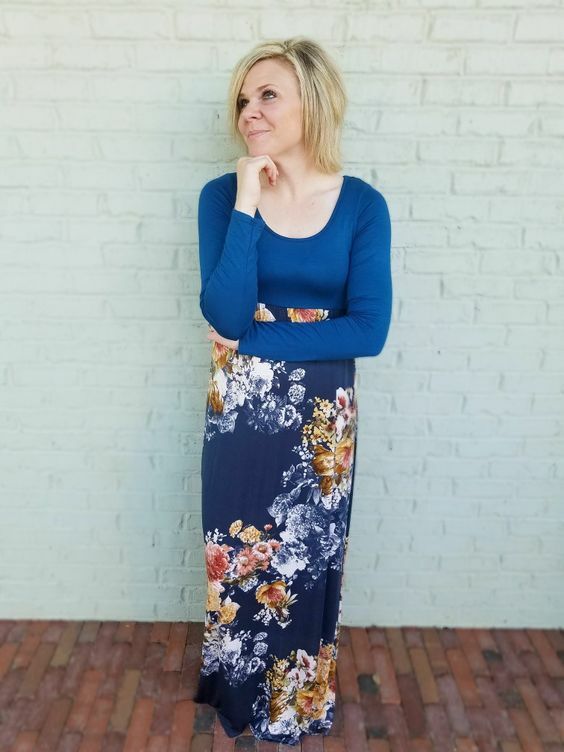 No matter your size or stage of life (pregnant, non-pregnant, post-partum), they have a flattering outfit just for you. 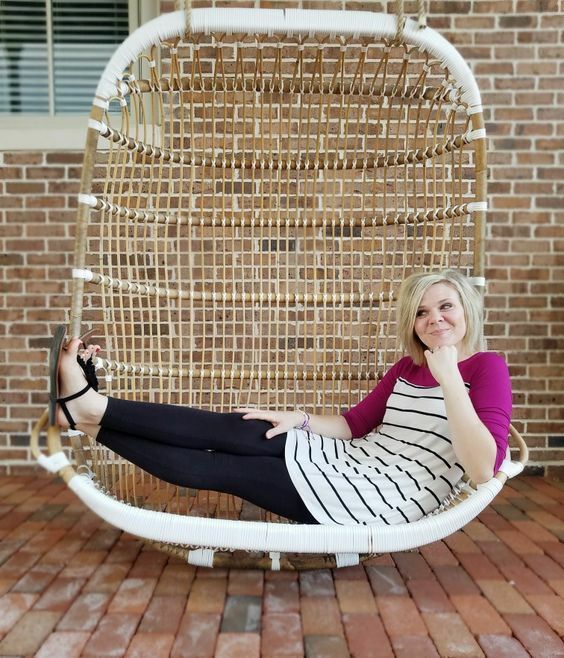 They are my go to for all of this season’s chic and cozy looks. And somebody please give this long-sleeved, trendy maternity (and non-maternity) dress some props. I am in LOVE. Granted, in the past, I was not a fan of florals. To be frank, I viewed a floral dress as synonymous with my great-grandmother’s window treatments… it’s okay if you feel the urge to slap me. But I am now a fan of a few of the floral patterns floating around this season. PinkBlush does it right, my friends. Boots! Brown boots, black boots, monogrammed boots, rain boots—give them all to this girl. Between the comfort and cuteness, these shoes bring happiness to my wardrobe. When I slide on a pair of boots, I’m as bubbly as my 5-year-old skipping stark naked through our house. Don’t judge. Pumpkins. Could it be fall without them?! A pumpkin doorhanger greets you as you enter my home and a few sparkly (yes, sparkly) pumpkins adorn my kitchen. Pumpkin décor brings fall to life indoors and is a must this season. And who could forget about pumpkin carving?! Personally, I loathe the process, but the finished product makes the arduous steps oh-so-worth-it! Plus, it keeps my kids busy and happy. I call that a WIN. Hay rides. Since I was a child, I have always loved hay rides. The gentle, crisp, fall breeze tapping against my cheeks and the laughter and songs cheerfully shared among fellow riders is a peaceful escape from all of my adult worries and cares. Hay riding is an absolute necessity in my book! Family time. Really, if you sum up these two previous points, you simply have family time. Fall tends to bring an assortment of family-friendly activities and fun. Harvest festivals, costume parties, and more provide my sweet family with plenty to do together. Family time is my favorite time! Fallish accessories and the spirit of giving. If there is one thing that makes me proud (in a good way), it’s small shops that combine fashion with a cause. 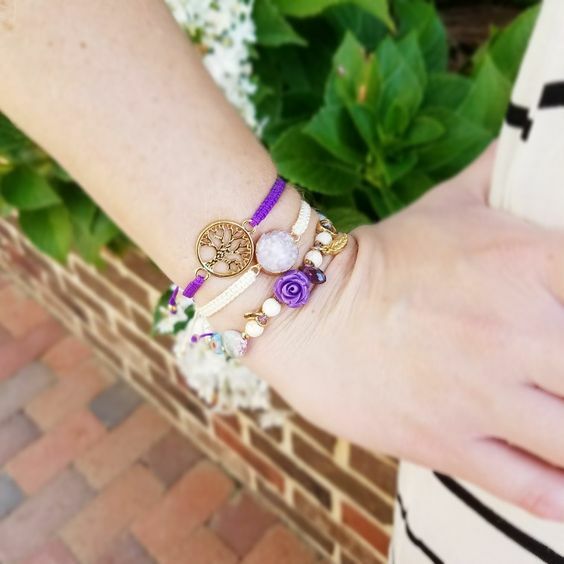 One of my favorite shops, Luca Love Bracelets, has been donating all of its profits to Hurricane Harvey relief. Their fall line is out and, as you can see, it’s gorgeous. Every time of the year, they give a portion of their profits to some sort of selfless cause, and this fall is obviously no different. 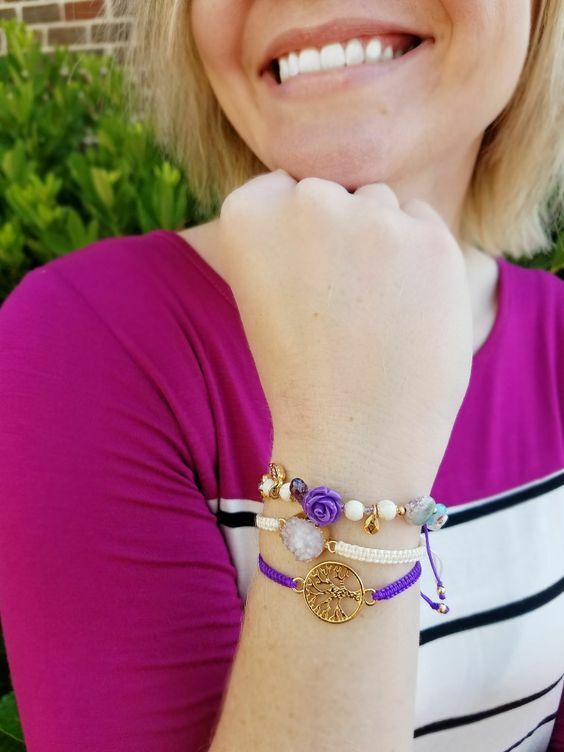 Check out their fall line, and help them make a difference this season! Costume fun. This is the one time of year when it is socially acceptable for adults to prance around in tutus and super hero costumes without looking like total fools. Holla! Overall, the spirit of thankfulness and gratefulness is what makes fall so special to me. I am blessed beyond what I deserve and adore the fact that there is an entire season dedicated to sharing gratitude. Nothing is more important than this, all season long. So, I’ll end here with a simple thank you. Thank you for enduring this post to the end, and thank you for your constant love, support, likes, comments, and shares (did I mention shares?). Seriously though… thank you! And now get outside and enjoy this fall season before it slips away, friends! I’m so with you – Fall is my favorite!! The clothes, accessories and pumpkin everything!! I’m about it all! Yessssss. Bring it all on! OMG I’m loving the fashions & yes to the spirit of gratefulness! I’m loving them too! Thanks, girl! I love your list all about why fall is the best season. Fall is definitely a favorite of mine. I love the pumpkins, holiday Starbucks cups, and your dress is really cute. I love all of that too. Thank you! Fall is my absolute favorite time and I don’t even like pumpkin spice! Haha so many other reasons to love it! Totally on bored with you! 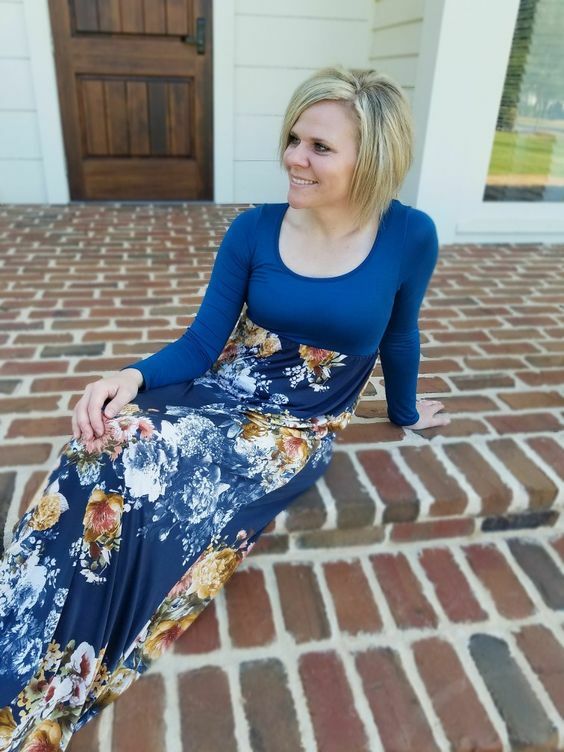 Fall is my absolute favorite season!